Don wants to stand before kings. Last week the world was on fire. But this week everyone got religion. Not anything Judeo-Christian; these people are hardly churchgoers—think about how Sylvia Rosen sticks out, praying for Don’s soul. But they work in marketing, and if there’s one thing in which they believe, it’s markets. If, as Seth pointed out last week, things fell apart in the last episode, then perhaps going public will make SCDP whole again. They have called in the bankers; they’re already imagining the wealth an IPO will bring. It’s a pleasure to see the partners revel in their own potential riches; Joan marvels at the idea of herself with a million dollars (about $6.5 million today)—as rich as Roger, or Don. The only thing they’ve yet to do before they take the firm public at $11/share is to tell Don. As the lesser partners suffer Don is in fine fettle. He’s insulted a client and romped with his wife, who is taking pains to please him. Into the maelstrom walks Roger Sterling to announce that they will be pitching GM a campaign for the car that will, eventually, become the Chevy Vega. And very unfortunately this sets into motion a great tidal wave of plot, more plot than this episode can handle, for as fortune would have it Ted Chaough’s firm is also pitching Chevy. We learn one of his partners has cancer. In the universe of this television show it suddenly becomes obvious that SCDP and Cutler, Gleason, and Chaough must merge. It’s a neat solution to a lot of dramatic constraints that were created by sending Peggy away from Don. Hanna, Seth, what did you think of the scene in which Don and Ted meet at the bar? I found it off-puttingly cute. More true, to me, was Don in the elevator with the demoralized Dr. Rosen, who has lost his chance to do the first American heart transplant. “I had a heart and a kid,” he said. “You make your own opportunities,” replies Don. There’s a verse in Proverbs that describes Don so perfectly that it’s hard to imagine that it’s not pasted up somewhere in the Mad Men writer’s room. “Seest thou a man diligent in his business? He shall stand before kings; he shall not stand before mean men.” Don doesn’t want to stand before shareholders, or Herb Rennet. He wants to stand before kings. He wants to stand before GM. Even if it means standing next to Ted Chaough. 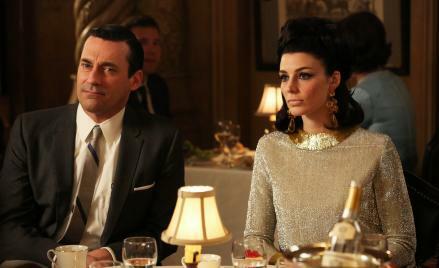 As things tie up, too neatly, Peggy is asked to write the press release (back to the title of the episode—”For Immediate Release”); she is told to “make it sound like the agency you want to work for.” That is the best part of advertising, the ability one has to recast the world in the most pleasurable light, to tell the story that everyone wants to hear. Peggy, adrift, in a bad apartment and unsatisfying relationship, has been placed, by her merging mentors, in charge of reality. The external reality is pretty bleak. King was shot. Bobby Kennedy will follow, and the Nixon presidency looms. But regardless of what is happening on the larger stage of the world, the characters on this smaller stage, even the dying, need to get back to work.